'Fall Out' is finished! Yay for finished quilts! The pattern for this quilt was my own design. I wanted to experiment with simple patchwork disintegrating into random pieces and negative space. I also used some offset wide solid borders to continue the feeling of motion. The fabric is 2wenty Thr3e by Julie Comstock for Moda and some Kona solids. 'Fall Out' finished at 54"x 64" after laundering. I matched binding with each border color because I didn't want a visual interruption at the edge of the quilt. I've never tried to match up a binding so precisely. It was a bit tricky but worked out great. I quilted the borders with a combination of swirl feathers and dense matchstick lines. 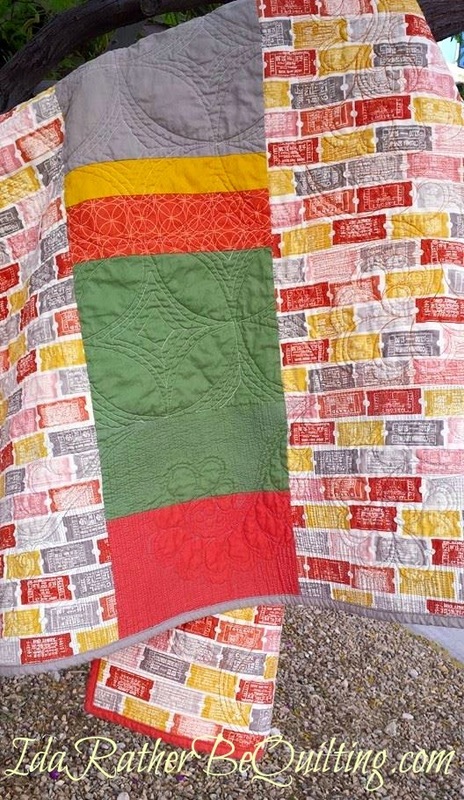 The center was an echoed orange peel quilting pattern. 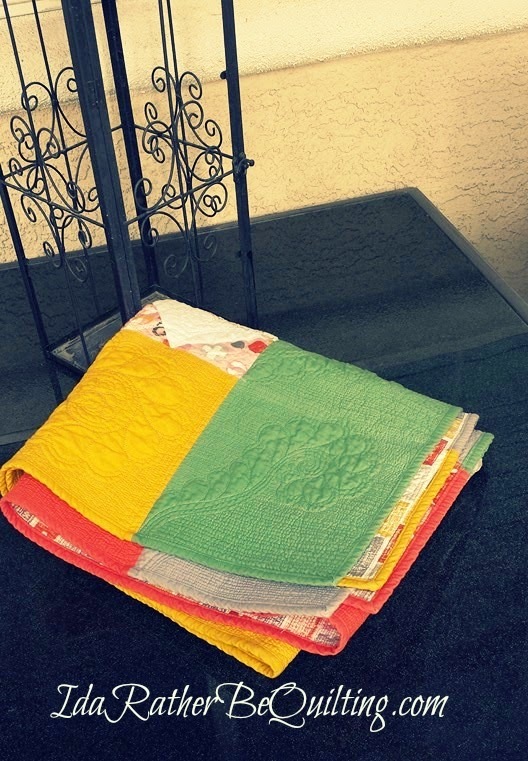 Once washed, this quilt had some serious texture! The orange peels show up nicely on the back. I have to admit, that pieced stip makes me happy. I like a pieced back so much better than a single fabric backing. I was fortunate enough to find some yardage at my LQS of a 2wenty Thr3e print. This line has been out for a while so I didn't think of finding coordinating backing but there it was in the clearance section! I worked really hard to finish this quilt in time for my Modern Quilt Guild meeting this past Wednesday. 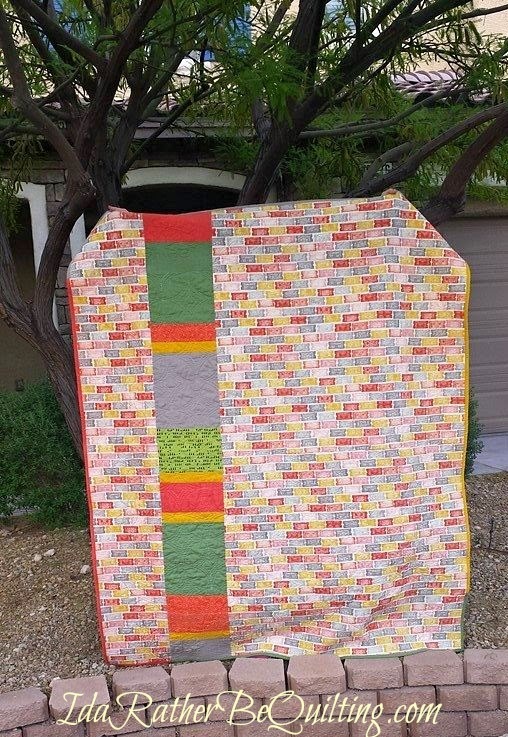 I had discovered some tension issues in the green border and had to rip a section out and re-quilt it. Then there were the four bindings and about a million threads to bury. I finished Wednesday early afternoon and threw it in the washer while I prepared all the other things I need to have ready for the meeting. (I'm on the board and had several responsibilities for the meeting.) And it wasn't until after I was at the meeting location setting up the large basket for Show and Tell items that I realized - the quilt had never made it out of the dryer. At first I was really disappointed but then I thought about my goals in creating this quilt. They weren't to get praise and pats on the back. I wanted to experiment with some concepts that intrigued me. I wanted to improve my FMQing skills and try some new things there. And I wanted to make a gift for a lovely family who has helped us out quite a bit in managing a home we still own in another state. None of those goals required me to have the quilt at the guild's Show and Tell. So I let the disappointment and irritation go and chose authenticity over accolades. It's ready to ship but I think I may wait until I can get some custom quilt labels ordered. I'm excited about that but haven't got the design just right yet. Stay tuned. And if anyone has experience ordering custom labels from Spoonflower, please let me know if you like them. Thanks for stopping by my blog today. 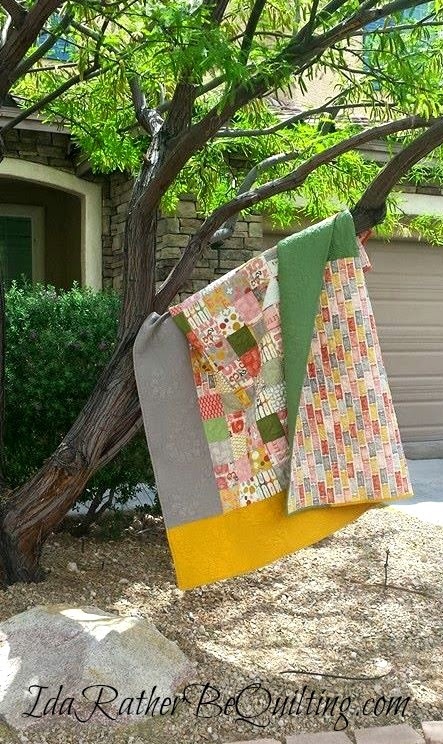 I hope you are having some great finishes in your part of the quilting world. If you are interested in reading my TGIF post - What I'm Trusting, Grateful for, Inspired by and how I'm practicing Faith - hop over to my other blog: Myordinarymagic.blogspot.com. What are you inspired by and grateful for today? Thank you Pauline. I was tempted right at the end to just use the opposite color binding on each border but I'm glad I stayed with my original idea. Love how this pattern plays with negative space...I'm also planning a quilt with matched pieced bindings. I just haven't gotten to that bit yet. Here's hoping it makes it to your next MQG meeting... you deserve a few pats on the back... whether you were looking for them or not! P.S. 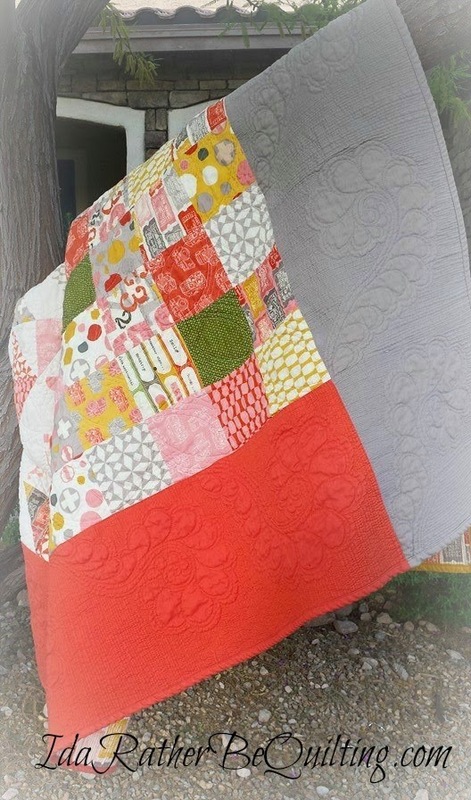 It would be even easier to admire your lovely quilt with larger photos! Hi Jenn. I'm hoping that the quilt will be in its new home by the next meeting. But if my labels take longer to arrive than I'm hoping - who knows? Maybe it will get a turn in Show and Tell. Thanks for the tips about the photos. I'll play with the sizes. I guess I was concerned about how the larger photos would show up on a phone screen. I think it's fantastic - well done! And I agree with Jenn - you deserve some pats on the back for that! Thank you Julie. I just popped over to see your blog. LOVE those cute little trucks! And kudos to you for tackling such a big quilt! I've only done a few big ones. 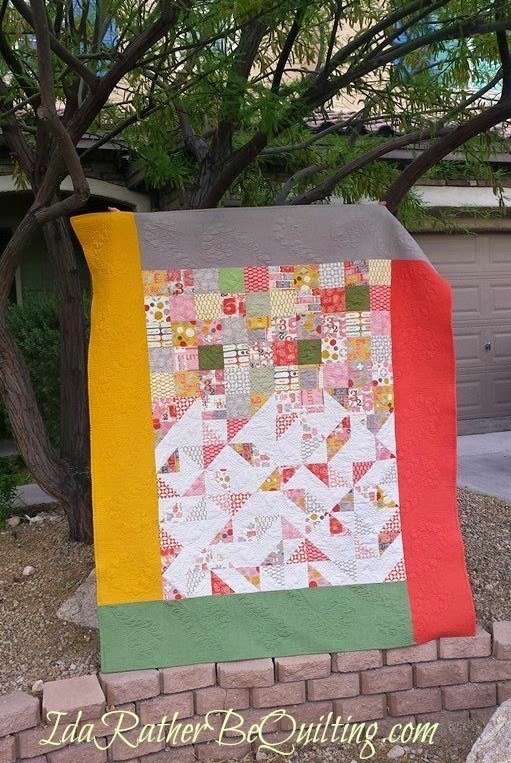 I have a top that size that needs to be sandwiched and quilted and I'm putting it off just because I prefer working with a smaller quilt like this one. This is beautiful Ida! I love how perfectly the binding matches up with the borders - how do you do that so precisely? It's amazing! Thanks Liz! The only trick to the binding is not joining the strips until right before the color change. Then you can measure out how much you have left, add a 1/4 inch and sew the new binding strip on. I waited until I only had about 5 inches before the change. Then you just pin it really good and sew slow until you get past the join. Awesome! I love how you matched the binding. I have never tried that, maybe I should :) Awesome finish, great job. Thanks Erica! I'd never matched binding either, but sometimes when you get a wild idea, ya just gotta try it! Thanks for stopping by. Why thank you, my BBQF! I learn from the best! Actually, I have long way to go, but it's a start! I'm so glad! I'd love to see it if you make one. I'm sure it would be wonderful in a different color palette.